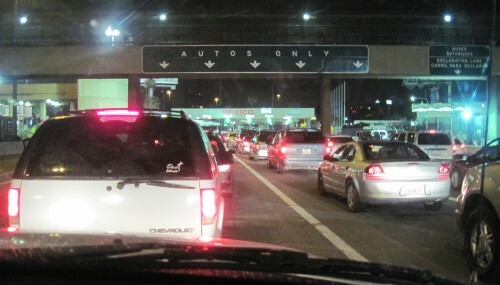 The Wednesday evening border crossing into Mexico. We fall asleep with and wake up to the sound of the forceful waves. We look out the window and there it is. The majestic Pacific Ocean. A big piece of water, oh so impressive. We are staying in the casita, behind Annie's home. Annie is the marketing representative of Puerto Nuevo, a quaint fisher town, just south of Rosarito. We're here by her invitation, so we can see for ourselves that it is safe to travel to and in this coastal area. 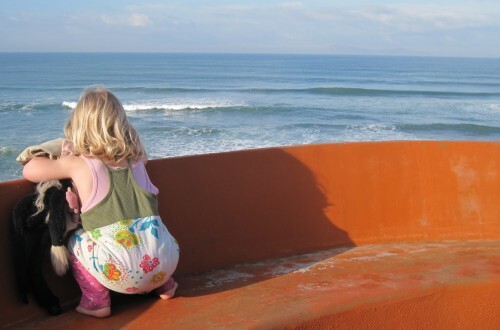 Robin has the entire ocean to look at. We sit down together for breakfast, a mexican egg dish. It tastes very good. All of a sudden Caitlyn, Annie's daughter, jumps up and points out a school of dolphins. They are traveling down the coast, right outside our window. Caitlyn spotted dolphins. We're all out to find them. A school of dolphins swims up and down the coast. The dolphins graciously swim through the waves. What a sight that must be if you're waiting on your surfboard for the perfect wave. 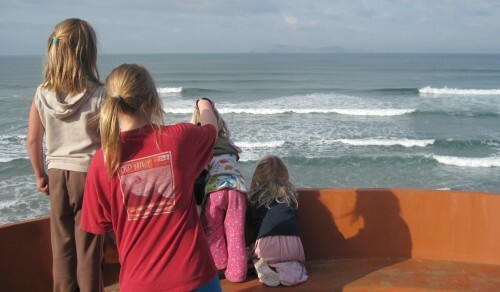 Throughout the day we see the dolphins several more times. It is late morning as we go on a coastal excursion with Annie. 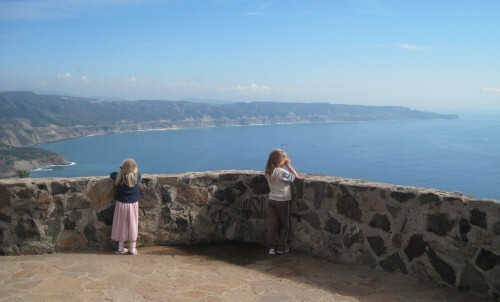 The journey takes us through downtown Rosarito, by Puerto Nuevo, to a viewing point 20 kilometers north of Ensenada. The road follows the coastline round and round and up and down. Looking south from a pretty view point. On our way back north we stop at the Comercial Mexicana, a supermarket, to pick up some groceries. Amarins is the one to go inside. The first thing is the bakery section. Oh, the delicious smell meet you at the door. Seven delicacies (for less then $3 total) end up in the shopping cart. Next some milk, fruit and cereal. Robin can't get enough of it. She'll walk out from time to time just to stare across the water. We enjoy the rest of the evening at the home on the ocean. Today we enjoy at the beach house. Enjoying a relaxing break from our journey. It feels good to have a moment to step away from it. Letting our hair down. Enjoying the hot tub. Taking a nap. The life of leisure... Taking the moments as we can. Rain, rain, rain. Where does it all come from! 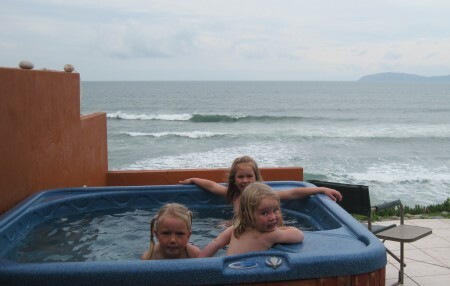 A day for indoor playing, looking at the crazy wavy ocean and enjoying the hot tub. The girls build a tent castle with Caitlyn. In the afternoon Jasmine goes shopping with Annie and Amarins. It is finally time for a new summer dress, as part of her birthday gift. Mexico seems to be the place to go, with all it's colors and frills. There must be a dress that suits Jasmine. We head for the indoor/outdoor market. Indoor, because you can go in the little shops. Outdoor, because you hop from shelter to shelter. We go from store to store. Jasmine knows there is always another store to go to, so she observes every dress in detail before moving on. As we walk from shop to shop, Jasmine developes a clear picture of the perfect dress. It has to be green and blue with flowers on it. The Mexican collar she can do without. Between the rain we hop from shop to shop. Next we visit the fancy Rosarito hotel. There is a pier into the ocean, although it is closed today. We still haven't found the perfect dress, but we won't give up. We head back through the water covered road in Rosarito. It's quite a wash, but looks like it drains well to the ocean. On our way out of town we stop at a Walmart (yes, they have them here too; a HomeDepot is across the street...) for some more groceries. Jasmine and Amarins head for the dresses. We look, but don't find, until... There it is the perfect dress. Pink... no flowers... Exactly what Jasmine wants. This seals the deal. Back at the house we enjoy a cloudy sunset with a walk on the beach. What a day, what a stay. In conclusion. It's been a good foreign experience. The people we met have been very friendly. The roads indeed are not as luxurious as in the US. We're glad we came by car and didn't put ourselves in the erratic traffic with our bicycle. There probably are better bicycle roads to take if you want to travel through Mexico. It is a great place for cheap shopping. The grocery experience shows it's much cheaper here, especially if you enjoy the bakery section like we do... Gas is also a lot cheaper, although that doesn't matter to us of course. 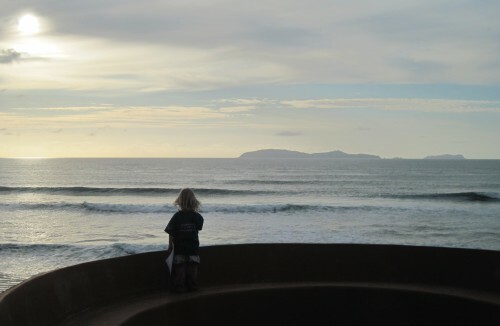 If you want to travel to the area for the weekend or for the day, you can contact Annie at Puerto Nuevo. She will be able to help you find what you're looking for.